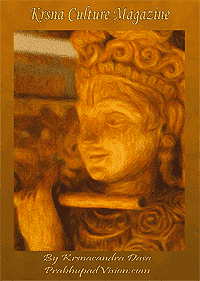 Anonymous – Śrī Vṛndāvan Dham: I had just had darśana at the Temple and was heading out the back to go to a internet café near the MVT when I came across a program for Jayapataka Maharaja. Luckily I had my camera with me and took some photos of what I could honestly not believe I was looking at. I was amazed to behold the banner that adorned the front of the hall as it showed a corpulent Jayapataka Maharaja pre brain stroke sitting on a lotus flower like he was Lord Brahmā! 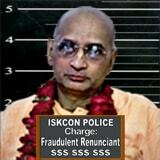 I know he thinks he is an associate of Lord Caitanya Mahāprabhu but this takes the cake! Come on Lord Brahmā? Did he authorize the banner or was it the result of overzealous disciples who believe all the hype about their guru being an associate of Lord Caitanya? 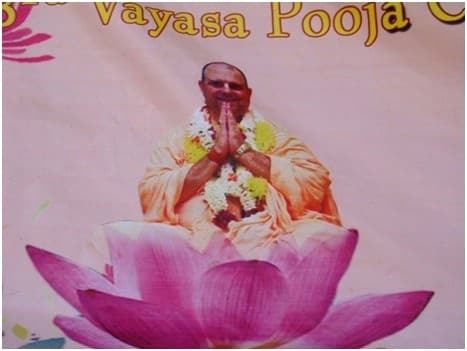 Either way it is in very bad taste to have a banner that has him seated upon a lotus flower like Lord Brahmā when he is having his ‘pushpa’ birthday party on Prabhupada’s Temple grounds! 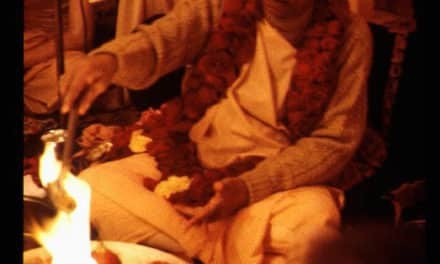 It also did not escape me that on the side of the banner was a picture of him and Prabhupada as if they were equals or judging from the lotus flower routine maybe they all think he is even greater than Prabhupada???? And what the heck is this all about Mahārāja thinking that his karmi name meant that he was none other than a former associate of Lord Caitanya. Really? Where did that come from? WOW what a huge stretch of the imagination that is! Śrīla Prabhupāda confirmed?? Where does he get off saying this and in his biography as well! I mean does he really think that he is sent to us by Lord Caitanya Himself? What about the blog where one of his disciples explains to other disciples something very freaky! I don’t mean to be offensive but it sounds like both Mahārāja and his disciples are on a bit of a trip. Where do they get off advertising Mahārāja as some kind of saktiavesa avatara associate of Lord Caitanya when there is no evidence whatsoever. Prabhupāda also laid no such claim to fame to justify his position and status in the Vaiṣṇava society so what example is this Mahārāja and his disciples setting. 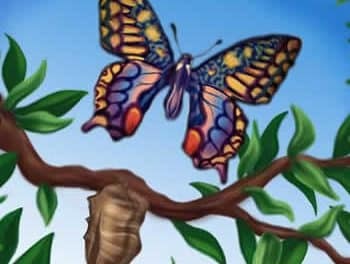 The GBC and Senior Godbrothers also say nothing so they must also believe or at least want to believe it as it makes their position more credible in a twisted sort of distorted way. How does the GBC allow Mahārāja and his crazed disciples get away with such outrageous statements? I think I read somewhere how Radhanath Swami claims that Mother Ganga gave him the maha mantra. I suppose give them some credit they could say even more outrageous self glorification stuff I suppose? Like Jayapataka Mahārāja is actually Lord Caitanya Himself in a covered and recovered manifestation and Radhanatha is really Rādhārāṇī Herself in disguise. Love to see these two dancing together! 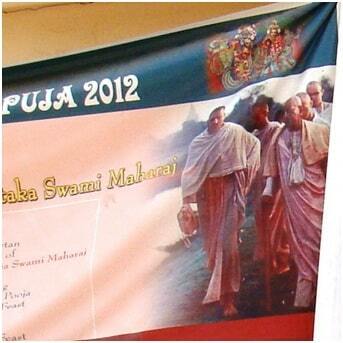 The Temple has no checks and balances either to allow this offensive banner to be displayed on ISKCON grounds. Well I suppose for a Temple and Temple President which gave tribute to both Narayan Mahārāja and Kirtanananda we can expect about anything. Every time I come to Vṛndāvan something like this happens. The last time Kirtanananda was buried and the GBC and Temple President went to pay their respects and some western women was lying down in front of the MVT saying she was beaten by MVT staff. So this time I brought a camera and it came to good use! Shree Vṛndāvan Dhama Ki Jaya! Anyway prabhujis just thought I would let you know what happened on my trip to the Temple the today! 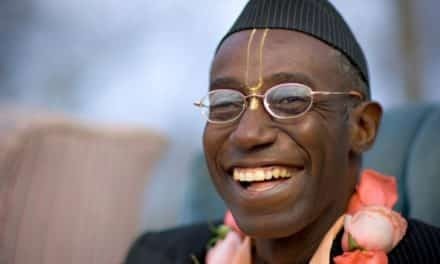 All glories to the maha bhagavata devotee Prabhupāda Ki Jaya! 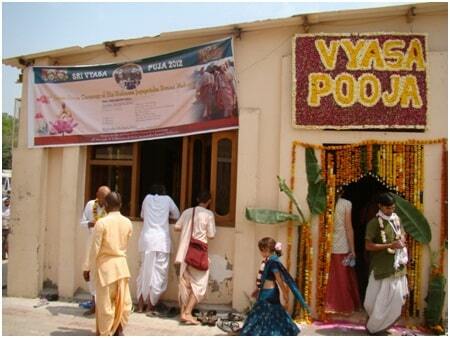 Ps: If you deleted the ‘vyasa’ and then the ‘ja’ above the door… I think this is the Lord tell us something about all of this nonsense. What Need Is There To Take Disciples?